Is there a verse from the Bible that has special significance to you? Maybe it's one piece of Scripture God used to inspire, challenge, or rescue you at a turning point in your life. Maybe it's a verse you learned as a child from a grandparent. Or one you recite each morning to begin your day. 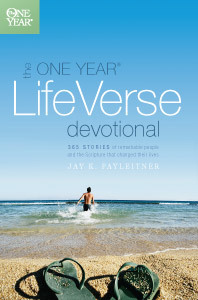 The One Year Life Verse Devotional contains stories of well-known authors and speakers, athletes and entertainers. Uncover how these key verses helped define people's role in God's plan--whether they are Bible characters or ordinary people. Discover God's revelations to his people through Scripture, including your very own life verse. Published by ~ Tyndale House Publishers. Remarkable People. Remarkable Stories. Remarkable Verses. Remarkable people and their inspiring Life Verses from the Bible. Discover for yourself the power of God’s Word in the lives of 365 people. START ANY DAY THE ONE YEAR WAY. Every One Year book is designed for people who live busy, active lives. Just pick it up and start on today’s date. Daily routine doesn’t have to be drudgery. One Year devotionals help you form positive habits that connect you to what’s most important. It’s convenient and easy to grow with God the One Year way.